The mouse recommendation is based on the WB results. We do not guarantee IHC-P for mouse. This antibody fails to detect endogenous natural samples in WB. Synthetic peptide within Human VEGFA aa 200-300 (C terminal). The exact sequence is proprietary. WB: Recombinant mouse and human VEGFA protein. 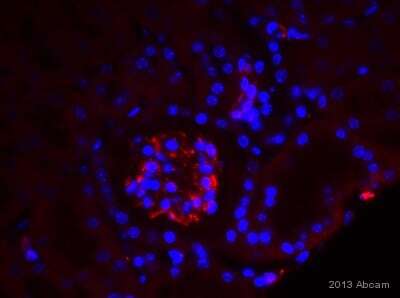 IHC-P: Human and mouse kidney tissue. ICC/IF: NIH/3T3 cells. Flow Cyt: NIH/3T3 cells. Our Abpromise guarantee covers the use of ab52917 in the following tested applications. For unpurified use at 1/100 - 1/1000 dilution. WB 1/10000. Detects a band of approximately 23 kDa (predicted molecular weight: 27 kDa). This antibody fails to detect endogenous natural samples in WB. Immunohistochemistry (Formalin/PFA-fixed paraffin-embedded sections) analysis of human kidney tissue sections labeling VEGFA with purified ab52917 at 1:100 dilution (2.96 µg/ml). Heat mediated antigen retrieval was performed using ab93684 (Tris/EDTA buffer, pH 9.0). Negative control shown in inset. 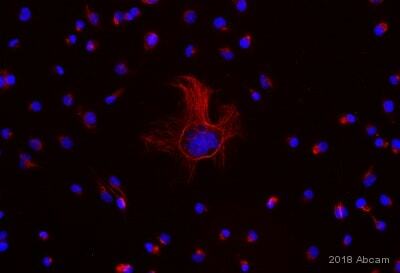 Purified ab52917 staining VEGF in NIH/3T3 (Mouse embryo fibroblast cell line) cells. The cells were fixed with 4% formaldehyde (10 min), permeabilized with 0.1% Triton X-100 for 5 minutes and then blocked in 1% BSA/10% normal goat serum/0.3M glycine in 0.1%PBS-Tween for 1h. The cells were then incubated with purified ab52917 at 5 μg/ml and ab195884, at 1/250 dilution, overnight at +4°C, followed by a further incubation at room temperature for 1h with an Goat anti-Rabbit Alexa Fluor®488 secondary (ab150081) at 2 μg/ml (shown in green). Unpurified ab52917 staining VEGF in mouse kidney tissue sections by Immunohistochemistry (IHC-P - paraformaldehyde-fixed, paraffin-embedded sections). Tissue was fixed with paraformaldehyde, permeabilized with 0.3% Triton X-100 and blocked with 5% serum for 45 minutes at 25°C. Samples were incubated with primary antibody (1/400 in 4% BSA + 5% serum in PBST) for 14 hours at 4°C. 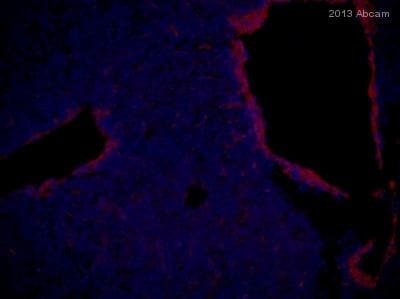 An Alexa Fluor® 546-conjugated Donkey anti-rabbit IgG polyclonal (1/300) was used as the secondary antibody. This blot was produced using a 10% Bis-tris gel under the MES buffer system. The gel was run at 200V for 35 minutes before being transferred onto a Nitrocellulose membrane at 30V for 70 minutes. The membrane was then blocked for an hour using 3% Milk before being incubated with ab52917 overnight at 4°C. Antibody binding was detected using an anti-rabbit antibody conjugated to HRP, and visualised using ECL development solution. Flow Cytometry analysis of NIH/3T3 (Mouse embryonic fibroblast) cells labeling VEGFA with purified ab52917 at 1:30 dilution (10 µg/ml) (red). Cells were fixed with 4% paraformaldehyde. 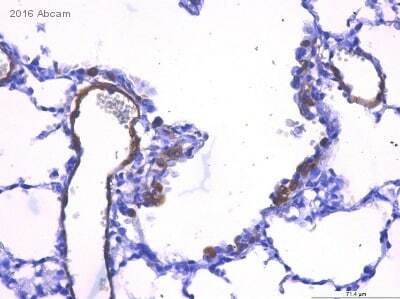 A Goat anti rabbit IgG (Alexa Fluor® 488) secondary antibody was used at 1:2000 dilution. Isotype control - Rabbit monoclonal IgG (Black). Unlabeled control - Cell without incubation with primary antibody and secondary antibody (Blue). Overlay histogram showing NIH/3T3 (Mouse embryo fibroblast cell line) cells stained with unpurified ab52917 (red line). The cells were fixed with 4% formaldehyde (10 min) and then permeabilized with 0.1% PBS-Tween for 20 min. The cells were then incubated in 1x PBS / 10% normal goat serum / 0.3M glycine to block non-specific protein-protein interactions followed by the antibody (unpurified ab52917, 1/1000 dilution) for 30 min at 22ºC. 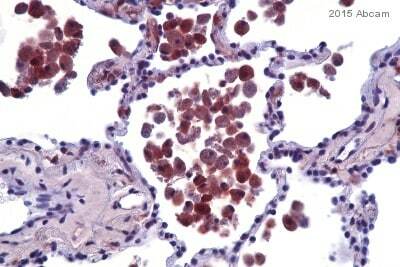 The secondary antibody used was Alexa Fluor® 488 goat anti-rabbit IgG (H&L) (ab150081) at 1/2000 dilution for 30 min at 22ºC. Isotype control antibody (black line) was rabbit IgG (monoclonal) (ab172730, 0.1 μg/1x106 cells used under the same conditions. Unlabeled sample (blue line) was also used as a control. This antibody gave a positive signal in NIH/3T3 cells fixed with 80% methanol (5 min)/permeabilized with 0.1% PBS-Tween for 20 min used at 1/100 dilution. Publishing research using ab52917? Please let us know so that we can cite the reference in this datasheet. I need to perform immunohistochemistry on paraffin-fixed neonatal mouse intestines for VEGF-165. Although you list this product (ab52917), I can't find published support that the product has been used for IHC in mouse. I would like to test this antibody for VEGF expression in mammalian cell lysates using Western blot analysis. As a positive control, I would like to include some recombinant VEGF protein in my SDS-PAGE. Please could you tell me what recombinant protein (5 ng) you used in the WB shown in the data sheet I received with this antibody. The recombinant protein that is the sample in the western blot on the datasheet is not commercially available. We do, however, have a similar protein, ab9571, which is a dimer of two 165 amino acid chains which contain the amino acid sequence of the ab52917 immunogen, and so will be recognized by ab52917. Click here (or use the following: https://www.abcam.com/index.html?datasheet=9571). Reduced samples will appear at about 22 kDa, similar to the western blot shown on the datasheet for mouse VEGF, ab62134. Click here (or use the following: https://www.abcam.com/index.html?datasheet=62134). Could you inform me whether the above mentioned antibody reacts with all human VEGF isoforms (121, 165, 189, and 206) and I could use this antibody to separate VEGF isoforms. I can confirm that ab52917 VEGF antibody [EP1176Y] recognizes a region right on the C-term. 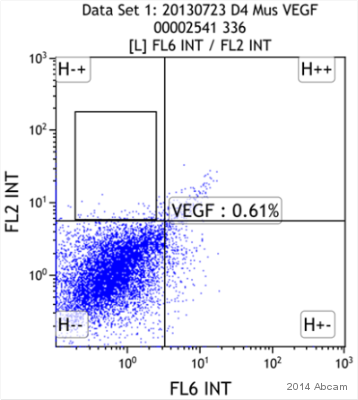 As far as we are aware, the only isoforms it will not detect are VEGF148 and VEGF165B. it should detect all the others.